9 January 2010, at 12:00a.m. In the fourth article of this series, Dr Steve Tullett, consultant for Aviagen specialising in incubation and fertility, discusses the reasons for examining the hatch debris. The article forms part of a recently published Ross Tech publication, Investigating Hatchery Practice. Before collecting the hatch debris, it is good practice to count and then weigh in bulk the Grade-A chicks from the tray in order to calculate an average chick weight and the chick yield (ratio of the average chick weight to the average fresh egg weight or egg weight at setting). The reasons for this are described more fully in a previous section of this publication [click here]. The number of dead chicks on the tray and the number of cull chicks should also be recorded. The unhatched eggs should then be collected onto egg trays for internal examination. For hatchery troubleshooting, debris from around 1,000 eggs set should be collected, taking samples in a structured way from throughout the setter. It is important to know whether or not the sample trays have had clear eggs removed, and if the spaces created were back-filled. In the past, we have probably relied too much on the analysis of the hatch debris, but the deterioration in some eggs, along with the complicating factor of contamination (Figure 15), can make the accurate differentiation of infertiles and early dead embryos difficult. However, if candling is performed early in incubation (see previous sections of the publication), it is much easier to correctly place eggs into the infertile and early dead categories. Examination of the hatch debris is really only for the accurate diagnosis of embryo deaths from the 'Blood Ring' stage onwards. A detailed list of diagnostic features for each stage is given in Tables 1 and 2 in a future section of this publication. Decomposition after death means that in the hatch debris there is often no blood visible in eggs that died at the 'Blood Ring' stage. A clear area in the centre of the egg caused by the fluid-filled amniotic sac may be the only evidence after 21 days of incubation (Figure 16). The amniotic sac can be lifted out with forceps and the remains of the embryo may be found within it (Figure 17). Embryos at the 'Feathers' stage are easily identified in the hatch debris (Figure 18). If in doubt, it is better not to try to distinguish between infertile and early dead embryos in the hatch debris, but to note if the infertiles plus early deads exceed target. More accurate examination may then be made of fresh unincubated, or partially incubated eggs or incubator 'clears'. When examining hatch debris any malformations of the embryo should also be recorded (e.g. exposed brain, extra limbs, exposed intestines) and the position of embryos that were close to hatching should be noted. The normal hatching position is where the spine of the embryo runs parallel to the long axis of the egg and the beak is positioned underneath the right wing. The tip of the beak is directed towards the air cell in the blunt pole of the egg. When the beak is under the right wing, the wing holds the shell membrane away from the face of the embryo and thus gives the beak more freedom of movement. In addition, the wing helps stretch the inner shell membrane and helps the piercing of this membrane by the beak. In this way, the embryo gains access to the air cell of the egg and begins to ventilate its lungs. If the head of the embryo has turned to the right, it stands a good chance of hatching. However, the actual hatching percentage will be influenced by whether the head is above or below the right wing or in the large end or small end of the egg. This is the normal position for the majority of 18-day old embryos and the head normally then begins to turn towards the air cell as the embryo assumes the normal hatching position on day 19. Embryos with their head between their thighs in the hatch debris probably represent either embryos dying around day 18 of incubation or, if still alive, embryos in which development has been retarded. Easily identified because the hocks, yolk sac and/or navel of the 18-day+ embryo are immediately visible on opening the shell over the air cell (Figure 19). This position is commonly seen in eggs that have been incubated upside down and is also more prevalent in eggs that have been incubated horizontally compared to eggs incubated with their large ends uppermost. The position can occur in eggs that have been incubated the right way up (especially those eggs with a rounder shape), eggs which have been exposed to high temperatures in the setters or when the angle of turning is too small. The frequency of this malposition is heavily influenced by the percentage of eggs that are set upside down. Ideally, the frequency of this malposition should be less than 10 per cent of total malpositioned embryos. 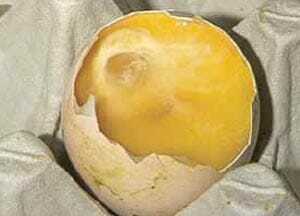 Eggs that have been set upside down can be reinverted up to day eight of incubation without ill effect. Inverting eggs after this time risks breaking the blood vessels in the chorioallantois which is beginning to attach itself to the shell membranes from day nine onwards. Embryos that are upside down on day 20 of incubation hatch at about 80 per cent of the normal rate. This malposition is more prevalent in eggs incubated large end up than eggs incubated horizontally. In many instances the beak will be above the left wing. When the head turns to the left it reduces the chances of hatching to about 20 per cent. The incidence of this position is five times greater in eggs incubated horizontally than large end up and is thought to be nearly always lethal. However, it is a difficult malposition to recognise. A common malposition in which one foot or both feet become trapped between the head and the shell (Figure 20) and prevent the normal back thrusts of the head required to pip the eggshell. The feet of the embryo are also involved in the final rotation of the embryo as it cuts off the top of the eggshell to emerge from the egg. Thus, if the feet over head position has not prevented pipping of the shell, it may prevent the final rotation and escape of the embryo. This is usually the second most common malposition, representing about 20 per cent of the total malpositioned embryos. This is usually the most commonly recorded malposition, representing 50 per cent or more of the total malpositioned embryos. Many embryos will have hatched from this position and it is often regarded as a natural variant of the normal hatching position. However, it has recently been suggested that an excess of embryos in this position could be an indication of embryos experiencing heat stress. Linoleic acid deficiency has also been linked to this malposition. A combination of malpositions may occur in the same embryo. It is a topic of debate whether contamination has always killed the embryo or whether the contamination was held in check until the embryo died. 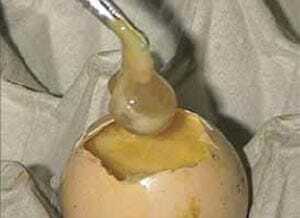 Nevertheless, every egg opened should be assessed for bacterial contamination, e.g. 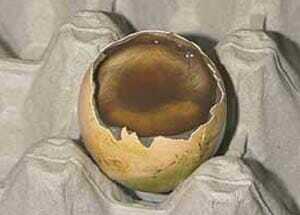 egg contents green, black, emitting rotten odours or egg explodes on opening. However, colour should not be the sole guide as brown coloration can be due to the deoxygenating process. Heavily contaminated eggs often explode on opening and in others the embryo may be hard to distinguish easily. It is not important to accurately record the time of embryo death in grossly contaminated eggs. The objective is to record the total percentage of contaminated eggs and compare the result with standards from best practice. This will enable you to assess the effectiveness of your egg handling and sanitation procedures. The eggs could be recorded as an 'Early rot' if the embryo died at the 'Black Eye' stage or before, 'Late rot' if it had reached the 'Feathers' stage or simply recorded as 'Contaminated'. Aspergillus represents a special case of contamination and can be a serious problem in some areas. Whenever eggs are opened through the air cell and mould growth is observed on the inner shell membrane this should be recorded as a potential aspergillus contamination and care should be taken not to breathe in or spread the mould spores. - You can see other articles in this series Investigating Hatchery Practice by clicking here.